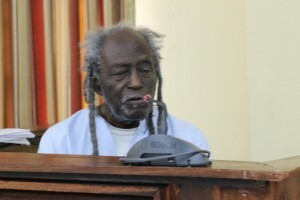 Eusi Kwayana testifying before the Walter Rodney Commission of Inquiry. Seeing a clipping of an accusation of corruption and crookery against me and a woman colleague has kept me from expressing any opinion on the several issues of public morality in Guyana. I know that I am not perfect. but feel we should all aim at that and be open to scrutiny so as to qualify for public roles. The late Troy Kellam took me to Moray House and to a tomb in Sparendaam and to Buxton twice, all at their own expense. Friends in the USA subscribed my air fare and my wife gave me money for myself and a friend of hers. I thought about the accusation and perhaps stupidly sought the help of the newspapers with a record of freedom of expression. I would on no account enter into “fending and proving” with the editor whose paper had maliciously called me “chief cook and bottle washer in the 1962 budget disturbances which were subject to a Commonwealth Commission of Inquiry and much documentation. The contending sides did not seem to need any outside help to cook or wash their bottles. Yet a reckless columnist could write that claim and get away with it, and pat himself on the back as a (mis)leading columnist and expert in stereotype. The busy editors may not have seen my letter. In any case I received no reply and got no news of an investigation. I therefore repeated my request to the editors in a second email dated February 1,2016 In each case the Subject line read : For the Editor ‘s attention. I thought that editors would see the accusation as a chance to call on the government to give details and documents of COI expenditure which had been used as an issue. The October 16 publication had called on Dr C Y Thomas to investigate the allegation as a case of corruption. We sued for libel assisted by Attorney at Law Mr. Alan Lancaster. The case was heard in August,2013. Dr Hinds attended in person and I appeared through Skype. As I understand it the matter reached the stage of quantity of damages to be awarded against the newspaper. I again invite the editors to consider the investigation have requested and not to treat it as my problem and that of Citizen Andaiye.